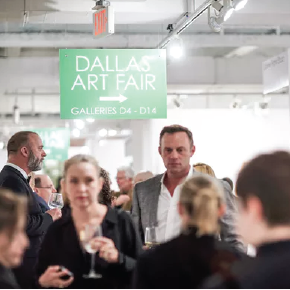 Since its austere beginnings, during the Great Recession of 2009, the Dallas Art Fair has undergone stunning growth, so much so that co­founder John Sughrue sees this year's lineup as "our strongest and most international to date." As founding partner Chris Byrne put it a year ago, the fair's maiden voyage just happened to have launched "three months after the world ended." So much for that. From bearish to bullish in less than a decade, the fair now appears ready to take its place among some of the major art gatherings anywhere in the world. Sharing details of its ninth edition in an exclusive interview with The Dallas Morning News, fair officials announced Thursday that the 2017 event will showcase under one roof at Fashion Industry Gallery, between April 6 and 9, such elite venues as Gagosian Gallery (New York), Lehmann Maupin (New York and Hong Kong), Simon Lee Gallery (New York), Skarstedt Gallery (New York and London) and Shane Campbell Gallery (Chicago). But what separates 2017 from previous years is that the focus is more international than ever before. In addition to numerous galleries from European cities, other foreign imports include Beatriz Esguerra Art from Bogotá, Colombia; Carbon 12 from Dubai; Lawrie Shabibi from Dubai; and Páramo from Guadalajara, Mexico. In total, the fair will host more than 90 galleries from 16 countries. More than 30 of the 2017 participants are new to the fair; 70 percent are returnees. "The diversification and growth of our roster is a testament to the strength of the city's burgeoning collector community," Sughrue said in a statement. A year ago, Sughrue said he and Byrne have often joked "that it was one part naivete and one part courage that got us in the business. Little did we know when we launched in 2009 what we were up against." And yet, convening an art fair in such harsh beginnings may have given the pair a silver lining that, as much as any one factor, helps explain its success nearly a decade later. "In a bull market, people are not as motivated to try new things," Sughrue said in 2016. "But in the economic downturn, people had to reinvent themselves. That's what happened in Dallas, and I would say, yes, in retrospect, that really helped the fair." The 2017 fair will once again convene an opening gala with proceeds designated for the Dallas Museum of Art, the Dallas Contemporary and the Nasher Sculpture Center. The fair will, for the second year in a row, partner with the DMA in the Dallas Art Fair Foundation Acquisition Program. Fair officials said Thursday that funding for that endeavor has doubled to $100,000. Gavin Delahunty, DMA senior curator of contemporary art, will "select works directly from participating galleries," fair officials said, "to be purchased for the DMA's permanent collection." And the fair will coincide with major spring art events throughout the city: A solo exhibition featuring the work of Iris van Herpen at the DMA, where it opens May 21; a solo show by French artist Pierre Huyghe, the most recent winner of the Nasher Prize for Sculpture; and a three­way exhibition at Dallas Contemporary featuring Pia Camil, Taryn Simon and Keer Tanchak.